THE Zimbabwe Electoral Commission (ZEC) has registered more than two million people under the ongoing Biometric Voter Registration (BVR), with Bulawayo Province having the least number of registered voters at 17,5 percent. A ZEC statement shows that only 71 536 people have registered to vote in Bulawayo. Harare Province has 309 951 registered voters, Mashonaland East 259 731, Mashonaland Central 205 609, Mashonaland West 197 238, Manicaland 271 160, Midlands 272 013, Matabeleland North 106 906 while Matabeleland South has 84 324 registered voters with the registration progress at 28 percent. 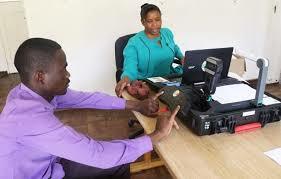 ZEC is targeting to have registered seven million people at the end of the BVR programme. In an interview yesterday, ZEC commissioner Dr Qhubani Moyo said the electoral commission is pleased to have surpassed two million registered voters. He said even Bulawayo will eventually come to the party. “We observed that Bulawayo has been a bit slow, but is coming up well. We still encourage the people of Bulawayo to go in their numbers and register as voters,” said Dr Moyo. He said the commission was intensifying its voter education programme to draw more people to register. Dr Moyo said apart from media advertisements, the electoral commission has engaged civic society and political parties to encourage their members to register to vote in next year’s elections. “The commission has also eased the voter registration process by making registration officers commissioners of oaths. Even political parties are deploying their teams on the ground to encourage people to register,” he said. Dr Moyo said ZEC was convinced that as the registration programme progresses into its third and final phase, more people from Bulawayo will register. “The low figures for Bulawayo can also be attributed to the fact that phase one was concentrated in low density suburbs with few people. Now we have moved to the high-density suburbs that are densely populated,” he said. The second phase of mobile BVR will end on November 13, while the third segment will take place between November 16 and December 1. The last leg will run from December 4 to December 19. Meanwhile, Midlands Province has recorded the highest number of people being turned away under the Biometric Voter Registration (BVR) exercise with 4 616 people so far. In a national report released recently, the Midlands Province had some remote areas where the BVR team were struggling to access. According to the report, the majority of people, who were turned away had brought wrong particulars, which include driver’s licences and photocopied national identity cards. Some were aliens while others were deemed under-age. Chief Mapanzure of Zvishavane said lack of information was the major reason why people were being turned away, especially in rural areas. “Here in Zvishavane for example, people are hesitant to go and register to vote because they do not understand the biometric registration process. Some villagers are actually afraid of having their pictures and fingerprints taken saying the process is a security threat. There is no enough information because most of them do not have radios or money to buy newspapers where these BVR advertisements’ are being placed,” he said.